For the latest updates on our Twain 2010 projects, follow me on Twitter. Perhaps the most famous person to have lived in Redding, only lived in Redding for a year and six months. Regardless of the amount of time he spent here, Redding, Connecticut loves Mark Twain and reading through his life and works, there really is no reason not to. August, 1908: Twain’s nephew drowns in NJ, he travels to NYC for funeral & retires from NYC for good. September 18, 1908: Burglars break in to house. The Burglary at Stormfield, September 18th, 1908. This is quite an interesting story which is followed by the burglar's own account. October 1908: Twain requires every male guest to leave $1 for library. May 1909: Close friend Henry Rogers dies. June 1909: Experiences heart pain & remains in bed most of June & July. August 1909: Paine moves into Stormfield to aid Twain. September 1909: 500 guests attend benefit for library fund. October 6, 1909: Clara’s wedding celebrated at Stormfield. November 19, 1909: Leaves for a month in “Bermooda”. Doctor’s orders. December 20, 1909: Twain returns to Redding. December 24, 1909: Daughter Jean dies while taking a bath. 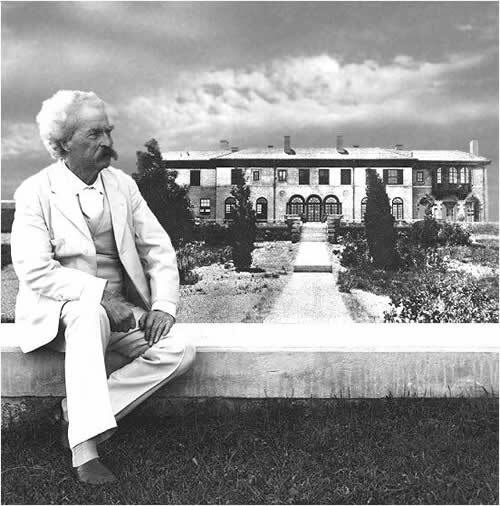 40 acre parcel of land Jean had called the Italian Farm sold to build a Jean Clemens Wing on the Mark Twain Library. January 1910: He returns to Bermuda. April 14, 1910: Twain returns to Redding in very poor shape. April 21, 1910: Twain woke suddenly, took Clara’s hand and said: “Goodbye dear, if we meet....”. The following information is from Albert Bigelow Paine's Biography of Mark Twain and Mark Twain's Speeches (New York: Harper and Brothers, 1910) describes his times in Redding, Connecticut (CT). In addition to the Paine information there are two more pages of Twain in Redding, CT.
Also available: New York Times Articles about Mark Twain in Redding, CT. Very interesting and informative! 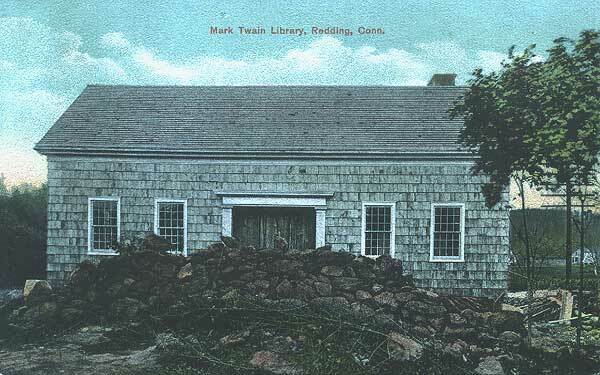 This page includes dates and articles on just about everything that went on at Twain's Redding Connecticut home. From "What Is Man?" and the Autobiography Chapter 248 of Albert Bigelow Paine, Mark Twain: A Biography (New York: Harper & Brothers, 1912), 1321-1323. Colonel Harvey came to Dublin, NH that summer and persuaded Clemens to let him print some selections from the dictations in the new volume of the North American Review, which he proposed to issue fortnightly. The matter was discussed a good deal, and it was believed that one hundred thousand words could be selected which would be usable forthwith, as well as in that long-deferred period for which it was planned. Colonel Harvey agreed to take a copy of the dictated matter and make the selections himself, and this plan was carried out. It may be said that most of the chapters were delightful enough; though, had it been possible to edit them with the more positive documents as a guide, certain complications might have been avoided. It does not matter now, and it was not a matter of very wide import then. The payment of these chapters netted Clemens thirty thousand dollars -- a comfortable sum, which he promptly proposed to spend in building on the property at Redding. He engaged John Mead Howells to prepare some preliminary plans. From "The Boys' Life of Mark Twain", page 65 by Albert Bigelow Paine. The house had been under construction for a year. He had never seen it– never even seen the land I had bought for him. He even preferred not to look at any plans or ideas for decoration. “When the house is finished and furnished, and the cat is purring on the hearth, it will be time enough for me to see it,” he had said more than once. He had only specified that the rooms should be large and that the billiard-room should be red. His billiard-rooms thus far had been of that color, and their memory was associated in his mind with enjoyment and comfort. He detested details of preparation, and then, too, he looked forward to the dramatic surprise of walking into a home that had been conjured into existence as with a word. It was the 18th of June, 1908, that he finally took possession. The Fifth Avenue house was not dismantled, for it was the plan then to use Stormfield only as a summer place. The servants, however, with one exception, had been transferred to Redding, and Mark Twain and I remained alone, though not lonely, in the city house; playing billiards most of the time, and being as hilarious as we pleased, for there was nobody to disturb. I think he hardly mentioned the new home during that time. He had never seen even a photograph of the place, and I confess I had moments of anxiety, for I had selected the site and had been more or less concerned otherwise, though John Howells was wholly responsible for the building. I did not really worry, for I knew how beautiful and peaceful it all was. The morning of the 18th was bright and sunny and cool. Mark Twain was up and shaved by six o’clock in order to be in time. The train did not leave until four in the afternoon, but our last billiards in town must begin early and suffer no interruption. We were still playing when, about three, word was brought up that the cab was waiting. Arrived at the station, a group collected, reporters and others, to speed him to his new home. Some of the reporters came along. The scenery was at its best that day, and he spoke of it approvingly. The hour and a half required to cover the sixty miles’ distance seemed short. The train porters came to carry out the bags. He drew from his pocket a great handful of silver. There was a sort of open-air reception in waiting–a varied assemblage of vehicles festooned with flowers had gathered to offer gallant country welcome. It was a perfect June evening, still and dream-like; there seemed a spell of silence on everything. The people did not cheer–they smiled and waved to the white figure, and he smiled and waved reply, but there was no noise. It was like a scene in a cinema. The clear-running brooks, a swift-flowing river, a tumbling cascade where we climbed a hill, all came in for his approval–then we were at the lane that led to his new home, and the procession behind dropped away. The carriage ascended still higher, and a view opened across the Saugatuck Valley, with its nestling village and church-spire and farmhouses, and beyond them the distant hills. Then came the house–simple in design, but beautiful–an Italian villa, such as he had known in Florence, adapted here to American climate and needs. The evening closed with billiards, hilarious games, and when at midnight the cues were set in the rack no one could say that Mark Twain’s first day in his new home had not been a happy one. From "Mark Twain: A Biographical Summary", page 2 By Albert Bigelow Paine From Albert Bigelow Paine, ed., Mark Twain's Letters (New York: Harper & Brothers, 1917). His life at Stormfield -- he had never seen the place until the day of his arrival, June 18, 1908 -- was a peaceful and serene old age. Not that he was really old; he never was that. His step, his manner, his point of view, were all and always young. He was fond of children and frequently had them about him. He delighted in games -- especially in billiards -- and in building the house at Stormfield the billiard-room was first considered. He had a genuine passion for the sport; without it his afternoon was not complete. His mornings he was likely to pass in bed, smoking -- he was always smoking -- and attending to his correspondence and reading. History and the sciences interested him, and his bed was strewn with biographies and stories of astronomical and geological research. The vastness of distances and periods always impressed him. He had no head for figures, but he would labor for hours over scientific calculations, trying to compass them and to grasp their gigantic import. I remember once finding him highly elated over the fact that he had figured out for himself the length in hours and minutes of a "light year." He showed me the pages covered with figures, and was more proud of them than if they had been the pages of an immortal story. Then we played billiards, but even his favorite game could not make him altogether forget his splendid achievement. Mark Twain loved Stormfield. Almost immediately he gave up the idea of going back to New York for the winter, and I think he never entered the Fifth Avenue house again. The quiet and undisturbed comfort of Stormfield came to him at the right time of life. His day of being the "Belle of New York” was over. Now and then he attended some great dinner, but always under protest. Finally he refused to go at all. He had much company during that first summer–old friends, and now and again young people, of whom he was always fond. The billiard-room he called "the aquarium,” and a frieze of Bermuda fishes, in gay prints, ran around the walls. Each young lady visitor was allowed to select one of these as her patron fish and attach her name to it. Thus, as a member of the "aquarium club,” she was represented in absence. Of course there were several cats at Stormfield, and these really owned the premises. The kittens scampered about the billiard-table after the balls, even when the game was in progress, giving all sorts of new angles to the shots. This delighted him, and he would not for anything have discommoded or removed one of those furry hazards. It was on the day before Christmas, 1909, that heavy bereavement once more came into the life of Mark Twain. His daughter Jean, long subject to epileptic attacks, was seized with a convulsion while in her bath and died before assistance reached her. He was dazed by the suddenness of the blow. His philosophy sustained him. He was glad, deeply glad for the beautiful girl that had been released. "I never greatly envied anybody but the dead," he said, when he had looked at her. "I always envy the dead." The coveted estate of silence, time's only absolute gift, it was the one benefaction he had ever considered worth while. Yet the years were not unkindly to Mark Twain. They brought him sorrow, but they brought him likewise the capacity and opportunity for large enjoyment, and at the last they laid upon him a kind of benediction. Naturally impatient, he grew always more gentle, more generous, more tractable and considerate as the seasons passed. His final days may be said to have been spent in the tranquil light of a summer afternoon. His own end followed by a few months that of his daughter. There were already indications that his heart was seriously affected, and soon after Jean's death he sought the warm climate of Bermuda. But his malady made rapid progress, and in April he returned to Stormfield. He died there just a week later, April 21, 1910. From "Books and Burglars" By Mark Twain. Address to The Redding (Conn.) Library Association, October 28, 1908. From Mark Twain's Speeches (New York: Harper and Brothers, 1910). Suppose this library had been in operation a few weeks ago, and the burglars who happened along and broke into my house -- taking a lot of things they didn't need, and for that matter which I didn't need -- had first made entry into this institution. Picture them seated here on the floor, poring by the light of their dark-lanterns over some of the books they found, and thus absorbing moral truths and getting a moral uplift. The whole course of their lives would have been changed. As it was, they kept straight on in their immoral way and were sent to jail. For all we know, they may next be sent to Congress. And, speaking of burglars, let us not speak of them too harshly. Now, I have known so many burglars -- not exactly known, but so many of them have come near me in my various dwelling-places, that I am disposed to allow them credit for whatever good qualities they possess. Chief among these, and, indeed, the only one I just now think of, is their great care while doing business to avoid disturbing people's sleep. Noiseless as they may be while at work, however, the effect of their visitation is to murder sleep later on. Now we are prepared for these visitors. All sorts of alarm devices have been put in the house, and the ground for half a mile around it has been electrified. The burglar who steps within this danger zone will set loose a bedlam of sounds, and spring into readiness for action our elaborate system of defences. As for the fate of the trespasser, do not seek to know that. He will never be heard of more. From "The Voyage Home" Chapter 292 of Albert Bigelow Paine, Mark Twain: A Biography (New York: Harper & Brothers, 1912), 1564-1574. I sent no word to Bermuda that I was coming, and when on the second morning I arrived at Hamilton, I stepped quickly ashore from the tender and hurried to Bay House. The doors were all open, as they usually are in that summer island, and no one was visible. I was familiar with the place, and, without knocking, I went through to the room occupied by Mark Twain. As I entered I saw that he was alone, sitting in a large chair, clad in the familiar dressing-gown. Bay House stands upon the water, and the morning light, reflected in at the window, had an unusual quality. He was not yet shaven, and he seemed unnaturally pale and gray; certainly he was much thinner. I was too startled, for the moment, to say anything. When he turned and saw me he seemed a little dazed. "Why," he said, holding out his hand, "you didn't tell us you were coming." "No," I said, "it is rather sudden. I didn't quite like the sound of your last letters." "But those were not serious," he protested. "You shouldn't have come on my account." I said then that I had come on my own account; that I had felt the need of recreation, and had decided to run down and come home with him. "That's -- very -- good," he said, in his slow, gentle fashion. "Now I'm glad to see you." His breakfast came in and he ate with an appetite. When he had been shaved and freshly propped up in his pillows it seemed to me, after all, that I must have been mistaken in thinking him so changed. Certainly he was thinner, but his color was fine, his eyes were bright; he had no appearance of a man whose life was believed to be in danger. He told me then of the fierce attacks he had gone through, how the pains had torn at him, and how it had been necessary for him to have hypodermic injections, which he amusingly termed "hypnotic injunctions" and "subcutaneous applications," and he had his humor out of it, as of course he must have, even though Death should stand there in person. From Mr. and Mrs. Allen and from the physician I learned how slender had been his chances and how uncertain were the days ahead. Mr. Allen had already engaged passage on the Oceana for the 12th, and the one purpose now was to get him physically in condition for the trip. How devoted those kind friends had been to him! They had devised every imaginable thing for his comfort. Mr. Allen had rigged an electric bell which connected with his own room, so that he could be aroused instantly at any hour of the night. Clemens had refused to have a nurse, for it was only during the period of his extreme suffering that he needed any one, and he did not wish to have a nurse always around. When the pains were gone he was as bright and cheerful, and, seemingly, as well as ever. On the afternoon of my arrival we drove out, as formerly, and he discussed some of the old subjects in quite the old way. He had been re-reading Macaulay, he said, and spoke at considerable length of the hypocrisy and intrigue of the English court under James II. He spoke, too, of the Redding Library. I had sold for him that portion of the land where Jean's farm-house had stood, and it was in his mind to use the money for some sort of a memorial to Jean. I had written, suggesting that perhaps he would like to put up a small library building, as the Adams lot faced the corner where Jean had passed every day when she rode to the station for the mail. He had been thinking this over, he said, and wished the idea carried out. He asked me to write at once to his lawyer, Mr. Lark, and have a paper prepared appointing trustees for a memorial library fund. The pain did not trouble him that afternoon, nor during several succeeding days. He was gay and quite himself, and he often went out on the lawn; but we did not drive out again. For the most part, he sat propped up in his bed, reading or smoking, or talking in the old way; and as I looked at him he seemed so full of vigor and the joy of life that I could not convince myself that he would not outlive us all. I found that he had been really very much alive during those three months -- too much for his own good, sometimes -- for he had not been careful of his hours or his diet, and had suffered in consequence. He had not been writing, though he had scribbled some playful valentines and he had amused himself one day by preparing a chapter of advice -- for me it appeared -- which, after reading it aloud to the Allens and receiving their approval, he declared he intended to have printed for my benefit. As it would seem to have been the last bit of continued writing he ever did, and because it is characteristic and amusing, a few paragraphs may be admitted. The "advice" is concerning deportment on reaching the Gate which St. Peter is supposed to guard: Upon arrival do not speak to St. Peter until spoken to. It is not your place to begin. Do not begin any remark with "Say." When applying for a ticket avoid trying to make conversation. If you must talk let the weather alone. St. Peter cares not a damn for the weather. And don't ask him what time the 4:30 train goes; there aren't any trains in heaven, except through trains, and the less information you get about them the better for you. You can ask him for his autograph -- there is no harm in that -- but be careful and don't remark that it is one of the penalties of greatness. He has heard that before. Don't try to kodak him. Hell is full of people who have made that mistake. Leave your dog outside. Heaven goes by favor. If it went by merit you would stay out and the dog would go in. You will be wanting to slip down at night and smuggle water to those poor little chaps (the infant damned), but don't you try it. You would be caught, and nobody in heaven would respect you after that. Explain to Helen why I don't come. If you can. There were several pages of this counsel. One paragraph was written in shorthand. I meant to ask him to translate it; but there were many other things to think of, and I did not remember. I spent most of each day with him, merely sitting by the bed and reading while he himself read or dozed. His nights were wakeful -- he found it easier to sleep by day -- and he liked to think that some one was there. He became interested in Hardy's Jude, and spoke of it with high approval, urging me to read it. He dwelt a good deal on the morals of it, or rather on the lack of them. He followed the tale to the end, finishing it the afternoon before we sailed. It was his last continuous reading. I noticed, when he slept, that his breathing was difficult, and I could see from day to day that he did not improve; but each evening he would be gay and lively, and he liked the entire family to gather around, while he became really hilarious over the various happenings of the day. It was only a few days before we sailed that the very severe attacks returned. The night of the 8th was a hard one. The doctors were summoned, and it was only after repeated injections of morphine that the pain had been eased. When I returned in the early morning he was sitting in his chair trying to sing, after his old morning habit. He took my hand and said: "Well, I had a picturesque night. Every pain I had was on exhibition." He looked out the window at the sunlight on the bay and green dotted islands. "'Sparkling and bright in the liquid light,'" he quoted. "That's Hoffman. Anything left of Hoffman?" "No," I said. "I must watch for the Bermudian and see if she salutes," he said, presently. "The captain knows I am here sick and he blows two short whistles just as they come up behind that little island. Those are for me." He said he could breathe easier if he could lean forward, and I placed a card-table in front of him. His breakfast came in, and a little later he became quite gay. He drifted to Macaulay again, and spoke of King James's plot to assassinate William II., and how the clergy had brought themselves to see that there was no difference between killing a king in battle and by assassination. He had taken his seat by the window to watch for the Bermudian. She came down the bay presently, her bright-red stacks towering vividly above the green island. It was a brilliant morning, the sky and the water a marvelous blue. He watched her anxiously and without speaking. Suddenly there were two white puffs of steam, and two short, hoarse notes went up from her. "Those are for me," he said, his face full of contentment. "Captain Fraser does not forget me." There followed another bad night. My room was only a little distance away, and Claude came for me. I do not think any of us thought he would survive it; but he slept at last, or at least dozed. In the morning he said: "That breast pain stands watch all night and the short breath all day. I am losing enough sleep to supply a worn-out army. I want a jugful of that hypnotic injunction every night and every morning." We began to fear now that he would not be able to sail on the 12th; but by great good-fortune he had wonderfully improved by the 11th, so much so that I began to believe, if once he could be in Stormfield, where the air was more vigorous, he might easily survive the summer. The humid atmosphere of the season increased the difficulty of his breathing. That evening he was unusually merry. Mr. and Mrs. Allen and Helen and myself went in to wish him good night. He was loath to let us leave, but was reminded that he would sail in the morning, and that the doctor had insisted that he must be quiet and lie still in bed and rest. He was never one to be very obedient. A little later Mrs. Allen and I, in the sitting-room, heard some one walking softly outside on the veranda. We went out there, and he was marching up and down in his dressing-gown as unconcerned as if he were not an invalid at all. He hadn't felt sleepy, he said, and thought a little exercise would do him good. Perhaps it did, for he slept soundly that night -- a great blessing. Mr. Allen had chartered a special tug to come to Bay House landing in the morning and take him to the ship. He was carried in a little hand-chair to the tug, and all the way out he seemed light-spirited, anything but an invalid. The sailors carried him again in the chair to his state-room, and he bade those dear Bermuda friends good-by, and we sailed away. As long as I remember anything I shall remember the forty-eight hours of that homeward voyage. It was a brief two days as time is measured; but as time is lived it has taken its place among those unmeasured periods by the side of which even years do not count. At first he seemed quite his natural self, and asked for a catalogue of the ship's library, and selected some memoirs of the Countess of Cardigan for his reading. He asked also for the second volume of Carlyle's French Revolution, which he had with him. But we ran immediately into the more humid, more oppressive air of the Gulf Stream, and his breathing became at first difficult, then next to impossible. There were two large port-holes which I opened; but presently he suggested that it would be better outside. It was only a step to the main-deck, and no passengers were there. I had a steamer-chair brought, and with Claude supported him to it and bundled him with rugs; but it had grown damp and chilly, and his breathing did not improve. It seemed to me that the end might come at any moment, and this thought was in his mind, too, for once in the effort for breath he managed to say: "I am going -- I shall be gone in a moment." Breath came; but I realized then that even his cabin was better than this. I steadied him back to his berth and shut out most of that deadly dampness. He asked for the "hypnotic injunction" (for his humor never left him), and though it was not yet the hour prescribed I could not deny it. It was impossible for him to lie down, even to recline, without great distress. The opiate made him drowsy, and he longed for the relief of sleep; but when it seemed about to possess him the struggle for air would bring him upright. During the more comfortable moments he spoke quite in the old way, and time and again made an effort to read, and reached for his pipe or a cigar which lay in the little berth hammock at his side. I held the match, and he would take a puff or two with satisfaction. Then the peace of it would bring drowsiness, and while I supported him there would come a few moments, perhaps, of precious sleep. Only a few moments, for the devil of suffocation was always lying in wait to bring him back for fresh tortures. Over and over again this was repeated, varied by him being steadied on his feet or sitting on the couch opposite the berth. In spite of his suffering, two dominant characteristics remained -- the sense of humor, and tender consideration for another. Once when the ship rolled and his hat fell from the hook, and made the circuit of the cabin floor, he said: "The ship is passing the hat." Again he said: "I am sorry for you, Paine, but I can't help it -- I can't hurry this dying business. Can't you give me enough of the hypnotic injunction to put an end to me?" He thought if I could arrange the pillows so he could sit straight up it would not be necessary to support him, and then I could sit on the couch and read while he tried to doze. He wanted me to read Jude, he said, so we could talk about it. I got all the pillows I could and built them up around him, and sat down with the book, and this seemed to give him contentment. He would doze off a little and then come up with a start, his piercing, agate eyes searching me out to see if I was still there. Over and over -- twenty times in an hour -- this was repeated. When I could deny him no longer I administered the opiate, but it never completely possessed him or gave him entire relief. As I looked at him there, so reduced in his estate, I could not but remember all the labor of his years, and all the splendid honor which the world had paid to him. Something of this may have entered his mind, too, for once, when I offered him some of the milder remedies which we had brought, he said: "After forty years of public effort I have become just a target for medicines." The program of change from berth to the floor, from floor to the couch, from the couch back to the berth among the pillows, was repeated again and again, he always thinking of the trouble he might be making, rarely uttering any complaint; but once he said: "I never guessed that I was not going to outlive John Bigelow." And again: "This is such a mysterious disease. If we only had a bill of particulars we'd have something to swear at." Time and again he picked up Carlyle or the Cardigan Memoirs, and read, or seemed to read, a few lines; but then the drowsiness would come and the book would fall. Time and again he attempted to smoke, or in his drowse simulated the motion of placing a cigar to his lips and puffing in the old way. Two dreams beset him in his momentary slumber -- one of a play in which the title-role of the general manager was always unfilled. He spoke of this now and then when it had passed, and it seemed to amuse him. The other was a discomfort: a college assembly was attempting to confer upon him some degree which he did not want. Once, half roused, he looked at me searchingly and asked: "Isn't there something I can resign and be out of all this? They keep trying to confer that degree upon me and I don't want it." Then realizing, he said: "I am like a bird in a cage: always expecting to get out and always beaten back by the wires." And, somewhat later: "Oh, it is such a mystery, and it takes so long." Toward the evening of the first day, when it grew dark outside, he asked: "How long have we been on this voyage?" I answered that this was the end of the first day. "How many more are there?" he asked. "Only one, and two nights." "We'll never make it," he said. "It's an eternity." "But we must on Clara's account," I told him, and I estimated that Clara would be more than half-way across the ocean by now. "It is a losing race," he said; "no ship can outsail death." It has been written -- I do not know with what proof -- that certain great dissenters have recanted with the approach of death -- have become weak, and afraid to ignore old traditions in the face of the great mystery. I wish to write here that Mark Twain, as he neared the end, showed never a single tremor of fear or even of reluctance. I have dwelt upon these hours when suffering was upon him, and death the imminent shadow, in order to show that at the end he was as he had always been, neither more nor less, and never less than brave. Once, during a moment when he was comfortable and quite himself, he said, earnestly: "When I seem to be dying I don't want to be stimulated back to life. I want to be made comfortable to go." There was not a vestige of hesitation; there was no grasping at straws, no suggestion of dread. Somehow those two days and nights went by. Once, when he was partially relieved by the opiate, I slept, while Claude watched, and again, in the fading end of the last night, when we had passed at length into the cold, bracing northern air, and breath had come back to him, and with it sleep. Relatives, physicians, and news-gatherers were at the dock to welcome him. He was awake, and the northern air had brightened him, though it was the chill, I suppose, that brought on the pains in his breast, which, fortunately, he had escaped during the voyage. It was not a prolonged attack, and it was, blessedly, the last one. An invalid-carriage had been provided, and a compartment secured on the afternoon express to Redding -- the same train that had taken him there two years before. Dr. Robert H. Halsey and Dr. Edward Quintard attended him, and he made the journey really in cheerful comfort, for he could breathe now, and in the relief came back old interests. Half reclining on the couch, he looked through the afternoon papers. It happened curiously that Charles Harvey Genung, who, something more than four years earlier, had been so largely responsible for my association with Mark Twain, was on the same train, in the same coach, bound for his country-place at New Hartford. Lounsbury was waiting with the carriage, and on that still, sweet April evening we drove him to Stormfield much as we had driven him two years before. Now and then he mentioned the apparent backwardness of the season, for only a few of the trees were beginning to show their green. As we drove into the lane that led to the Stormfield entrance, he said: "Can we see where you have built your billiard-room?" The gable showed above the trees, and I pointed it out to him. "It looks quite imposing," he said. I think it was the last outside interest he ever showed in anything. He had been carried from the ship and from the train, but when we drew up to Stormfield, where Mrs. Paine, with Katie Leary and others of the household, was waiting to greet him, he stepped from the carriage alone with something of his old lightness, and with all his old courtliness, and offered each one his hand. Then, in the canvas chair which we had brought, Claude and I carried him up-stairs to his room and delivered him to the physicians, and to the comforts and blessed air of home. This was Thursday evening, April 14, 1910. Photographs of Stormfield with a very descriptive write up of the house's rooms and layout. The Stormfield Project has begun, you can track it via my Mark Twain Stormfield Project blog. For the latest updates on our Twain 2010 projects, follow us on Twitter. www.twainweb.net The Mark Twain Forum (amazing insights). Here's a scrapbook with pictures of Stormfield from PBS. Click Here.